I don't venture much into Wal-Mart anymore. Honestly, the store is rather scary. It's always jammed packed and takes forever to get through the lines. That being said, I do like to check out their polishes when I garner up the courage to face the swarm of crowds! This is a nice color I picked up recently. I'm actually really impressed with this Pure Ice. This reminds me of a deeper version of Zoya's Gwin. I love how Zoya is the master of gold shimmer, but Pure Ice did just a good of a job here. I've also seen some other colors by Pure Ice that remind me of Zoya colors. Pure Ice is $2 so it's a great deal. I think even though this is a brighter color, it is suitable for autumn. 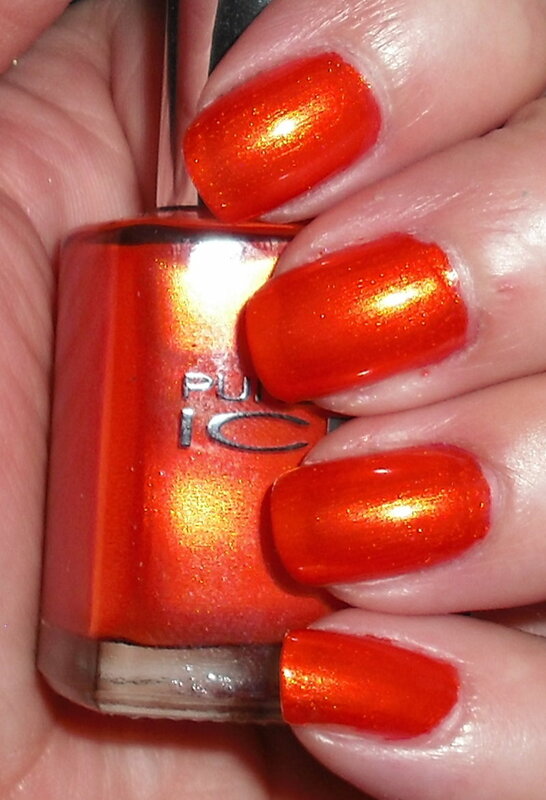 I think this would be a great color for Halloween, Thanksgiving, or any day! This reminds me of Wet n Wilds Inferno, very close Inferno might be a shade lighter. Nice post! This is so Florida! It almost looks juicy! i hate Wally world too but i love to save money, so i push and shove with the rest of them, lol. Pure Ice is a good brand. I love this and its perfect for Halloween! I just bought a Orly that looks a bit like this, but lacking the gold shimmer...which really is the best part of this!